Prior to 1950 the fashionable Daniels and Fisher Department Store was the crown jewel of the Denver skyline for many years until it fell into ruin during the 1950's. Built in 1911 and designed by architect F. G. Sterner, the D & F Tower was the tallest structure west of the Mississippi, at a height of 393 feet. Visitors to the 20th floor used to be able to see 200 miles in any direction. The building is of the Italian Renaissance style and is constructed of brick, stone & terra cotta. In the 1960’s after financial ruin the building was set to be demolished. The flagship store was destroyed but due to immense effort from preservationists in the early 1970’s, its grand clock tower was saved. 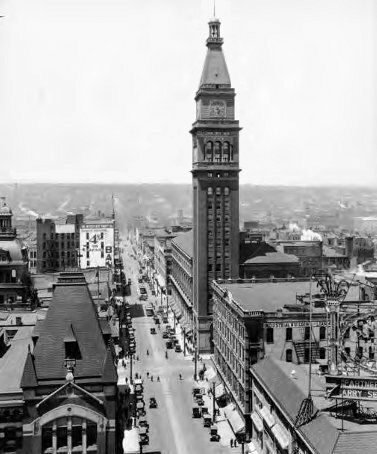 Now listed on the National Register of Historic Places and a Denver Landmark, The D & F Clock Tower is also a contributing building to the Downtown Denver Historic District. It nightly lights up the Denver skyline and remains one of the most iconic elements of the Denver skyline. © 2018 Clock Tower Events. All rights reserved.